In July 2015, I moved to Chennai, India. For everywhere I've lived and traveled in North America, I've used Google Maps to get around. I use it for directions. I use it to gauge distances. I use it for mapping bicycling routes. And I use it avidly to find locations of businesses. In Chennai, a beautiful city in South India, that last one doesn't always work. 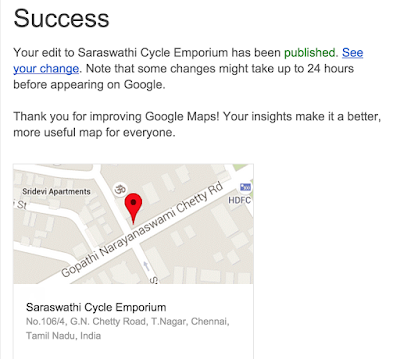 Very few businesses are mapped onto Google Maps and those that are often aren't correct. Three times, I've tried to find bicycle shops that just weren't there. Restaurants with the exact same name will appear on the map twice within a two block radius, clearly duplicate entries but not duplicate outlets in real life. I even went to a shop this week and confirmed the street address first with someone who worked there, but it wasn't where Google Maps said it was. I decided to do something about it. 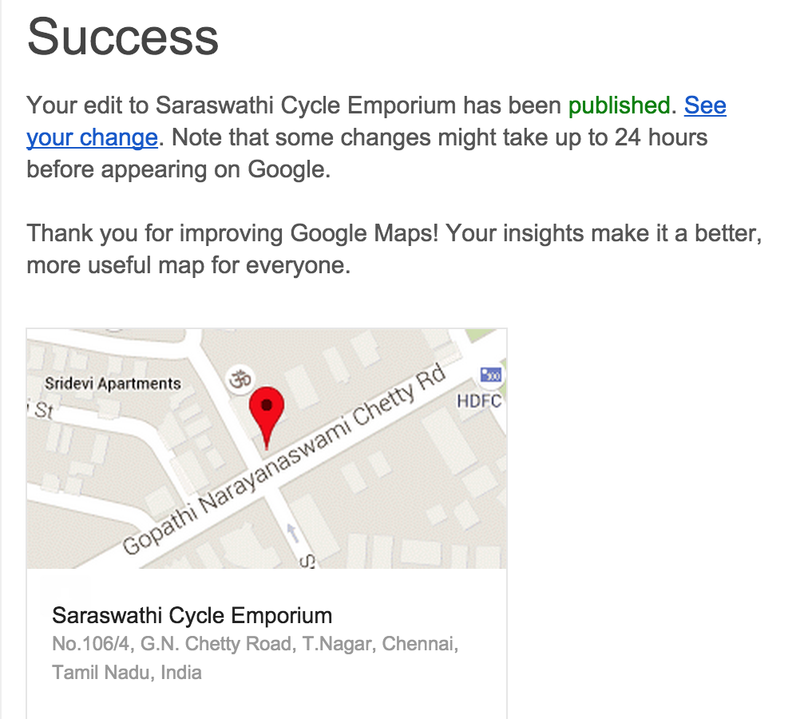 I started sending corrections to Google Maps. To me, it's similar to contributing to Wikipedia. I feel like I'm helping to make the Internet more valuable and accurate through a series of tiny actions that aren't time consuming. In the U.S., Canada, and certainly much of Europe, Google Maps probably doesn't need much updating. But if you live in a place where business information is often wrong (you can't correct the locations of parks, lakes, roads, or a few other things, as far as I know), there is something you can do about it. 1. Log into a Google account. You can't suggest edits otherwise. 2. Search for the business (it must already exist) in Google Maps. Click on it. 3. In the info tab that appears, look for the very last option in light gray: Suggest an edit. Click it. 4. Now you can drag the pin around the map and place it in the right spot. You can also change the listed hours, street address, and category of the business. You can also submit that the business is permanently closed. 5. Hit save and.... wait. You'll get an email if the suggestion is accepted. For me, it's taken anywhere from a few hours to a few days.